How funny, Sheri, I landed on your site after a google search to find pickled watermelon rinds. Thanksgiving appetizers and all. :-) Hope you are well! I miss eating watermelon rinds at holiday dinners. My grandparents always served when I was a kid. Now that they are gone I can't ask what the origins of this tradition is and why they were only served at a Thanksgiving or Chistmas dinners. I think I'll try your recipe and relive the memory. 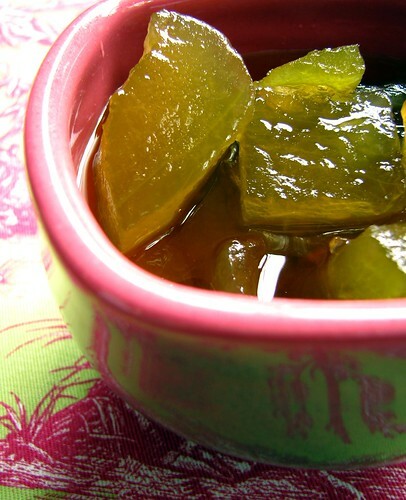 Pickled watermelon rind is awesome but it is certainly not a Southern thing. It is a Pennsylvania Dutch thing. Southerners just claim it kinda like grits, mac n cheese, liver mush, potato salad, cobbler, banana pudding ect ect, none of which have their origins in the south. It's like claiming that Italian food is a New York thing. I agree. I am from Amish area in Pennsylvania and this has always been around and prepared by years and years and I am not young and my grandmother and the women she grew up with made this. I also am a caregiver who is 93 and he asks for this all the time, but it is never like his Mother made he says. He is a Yankee to the highest degree as a New Englander.